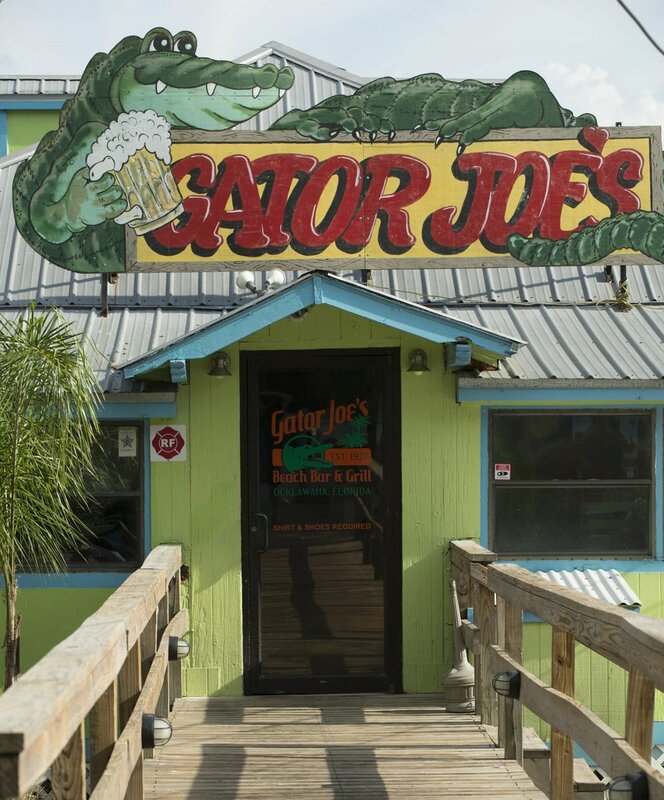 Ocklawaha — Gator Joe’s, located at 12431 SE 135th Ave, Ocklawaha, had several potentially hazardous violations during a recent inspection of the establishment. Many of the offenses were repeat violations. Employee personal food not properly identified and segregated from food to be served to the public. Several items stored on shelves in reach in cooler at bar area over beer, wine and produce. Discarded all. Employee personal items stored with or above food, clean equipment and utensils, or single-service items. Jacket on shelf containing dishes in kitchen. Moved. Employee with no beard guard/restraint while engaging in food preparation. Male employee at bar area. Floor, wall and/or fixed equipment soiled/has accumulation of debris. Room containing ice machine has walls ceiling and floor soiled with dust, debris and cobwebs. Floor under drink station near pass thru window. Wall in kitchen has accumulation of dust. Fan cover in kitchen has accumulation of dust. Ice buildup in reach-in freezer. On bottom of unit under steam table. Also, gaskets need cleaning. In-use knife/knives stored in cracks between pieces of equipment. One between table and reach in make table. removed. Old labels stuck to food containers after cleaning. On plastic pan. Also, flour on bins near hand sink in kitchen area. Wet wiping cloth not stored in sanitizing solution between uses. Several in kitchen and at bar. All placed in bucket. Potentially hazardous (time/temperature control for safety) food cold held at greater than 41 degrees Fahrenheit. In reach in make table: tomatoes 45° held overnight in unit. Manager discarded, stop sale issued. Raw animal food stored over or with ready-to-eat food in walk-in freezer – not all products commercially packaged. Raw steaks in pan over case of cheese sticks. Moved to proper order. Ready-to-eat, potentially hazardous (time/temperature control for safety) food marked with a date that exceeds 7 days after opening/preparation. Corn dogs in reach in cooler at kitchen has a date mark of 1/19. Stop sale issued. Stop Sale issued due to food not being in a wholesome, sound condition. Corn dog, date mark exceeds 7 days. Tomatoes 45° in reach in cooler overnight. Toxic substance/chemical stored by or with single-service items. Bottle of cleaner on shelf near sleeves of cups at bar. Moved. Accumulation of black/green mold-like substance in the interior of the ice machine. On deflector plate of unit in server station. Also, soda guns at outside bar are soiled. All cleaned. Handwash sink not accessible for employee use at all times. Sink near ice machine has mop bucket in front. Sink on cookline has brooms, dustpan and squeegee in front of it. A followup inspection will be required.